are available in PDF Format. 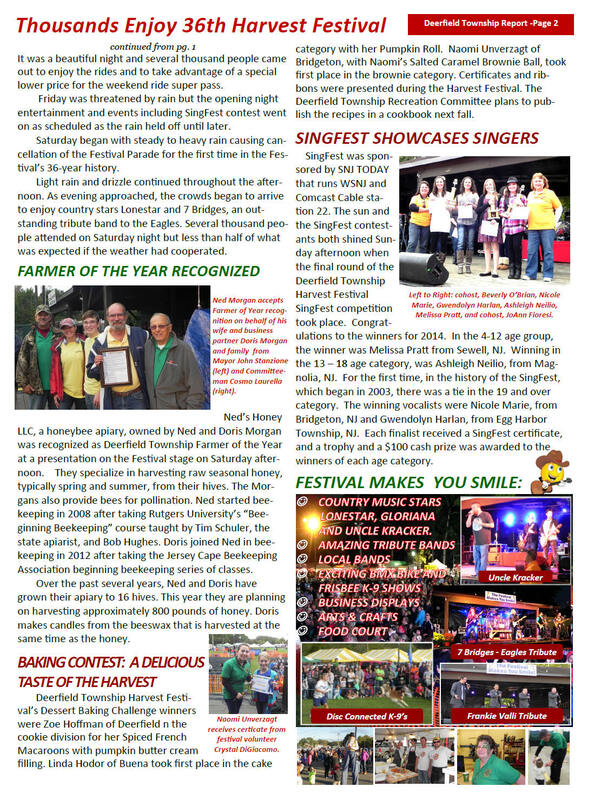 See latest newsletter pages below. You will need a current version of Adobe Acrobat Reader to open the PDF files. To obtain a free version of Adobe's Acrobat Reader click here. 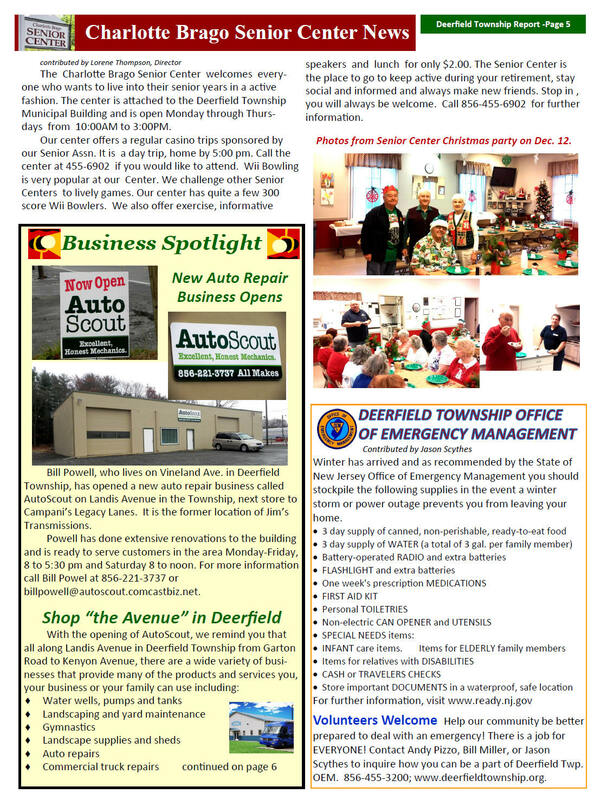 Send photos and stories by email to deerfield@deerfieldtownship.org . Days after returning from deployment with the Air National Guard, Joseph V. Sparacio started a different kind of public service by being sworn-in to Deerfield Township Committee. "My family has been here for the last 100 years and I want to be here for the time forward," he said. "It's time to do my part in the community." He started deployment to Kuwait after winning the primary election in June and, despite not even being in the country for the election, managed to be the top vote getter in the 2014 election for Deerfield Township. "I was very, very proud that he won, but I was more proud that he had the ambition to run," said Anthony Sparacio Jr., his father, who said he voted for him. Because he was on the other side of the world, Sparacio didn't know he won the election until the next day. He was sworn-in to committee during Wednesday's meeting by Cumberland County Freeholder Carman Daddario. His girlfriend Micole Mosley stood beside him during the ceremony. The entire meeting room was filled with residents, families and friends to celebrate the occasion. Sparacio joined the Air National Guard just out of high school when he was 18. That was nine years ago. He is now a station captain and works as a firefighter. "I didn't know if I wanted to go to college yet or to stay around and work full time, so I wanted to serve my country and also have the opportunity to go to school," Sparacio said. He returned a week ago, to the delight of his family. "We're having Christmas and Thanksgiving and everything rolled into one," his father said. He wasn't here for the reorganization meeting last January so this meeting was an opprtunity for a more formal ceremony for the public to witness. Sparacio is also a local business owner with Maple Valley Nursery. He was welcomed to his new position by the rest of township committee at Wednesday's meeting and even led the flag salute. "He's going to be great because everyone that has come up here has done a good job," said Mayor Cosmo Laurella. "They know they're representing Deerfield Township, it's a small community and everyone sees you." 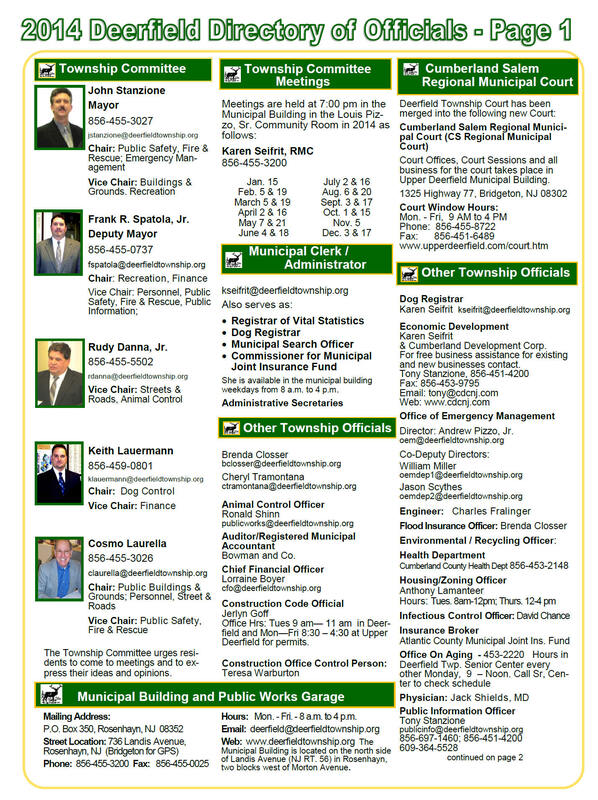 On Wednesday, January 7, 2015, the Township Committee conducted its annual reorganization meeting. Long-time Township Committeeman Cosmo Laurella was elected by his fellow Committeemen as Mayor. 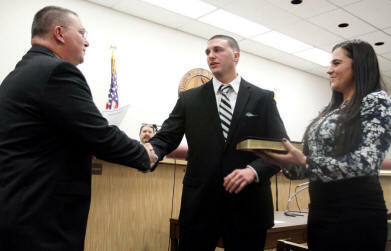 He was sworn in by Township Solicitor Michael Testa. John Stanzione, who served as Mayor in 2014 was elected to serve as Deputy Mayor. Committeeman Frank Spatola was sworn in to a new three-year term on the Township Committee. Stanzione was sworn in in by County Clerk Celeste Riley and Spatola was sworn in by Solicitor Mike Testa. 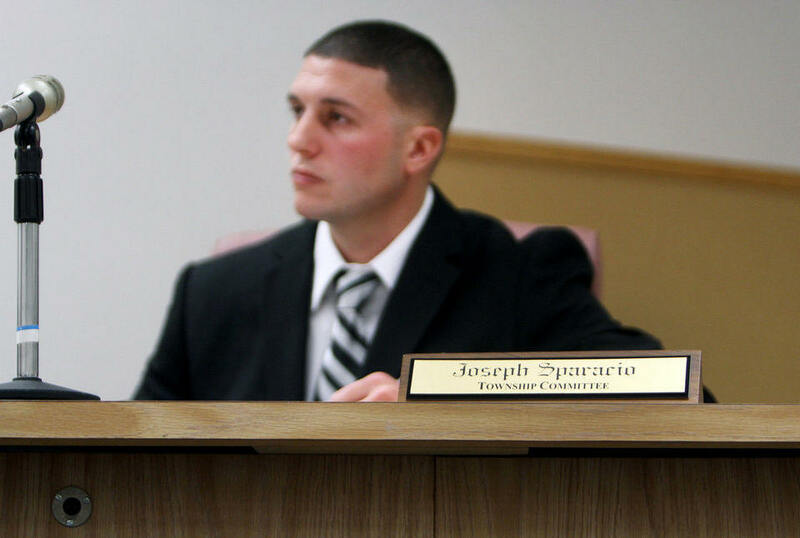 "I congratulate Frank Spatola for his re-lection, John Stanzione for selection as Deputy Mayor and look forward to welcoming newly elected Committeeman Joseph V. Sparacio to the Committee when he returns from his Air National Guard deployment in Kuwait, said Mayor Laurella. He also thanked the Committee for putting their trust in him by selecting him as Mayor. Mayor Laurella noted projects accomplished in 2014 including new landscaping at the municipal hall thanks to Boy Scouts and other volunteers, improved security in the municipal building with cameras added and repaving of Cedar Street. He thanked public works employees and office staff and other employees and volunteers for their good work for the Township. 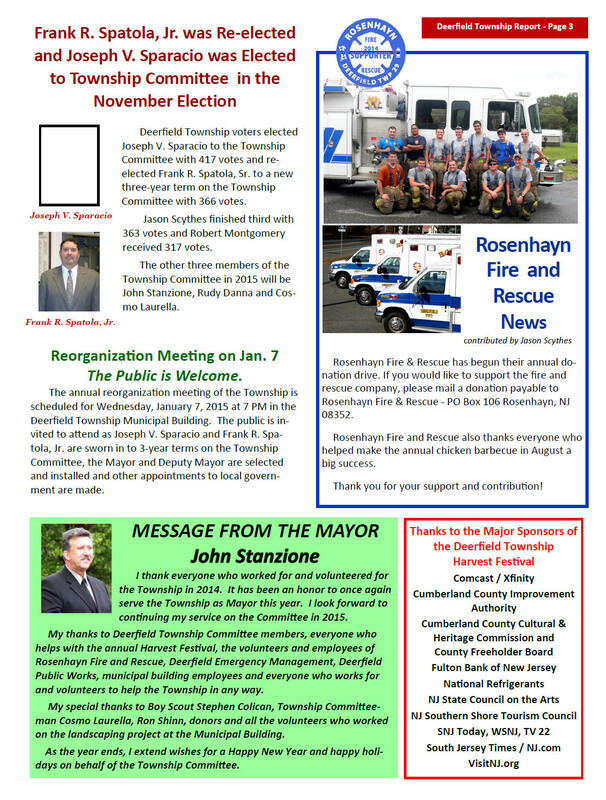 He said in 2015 the Township will purchase a new rescue truck for Rosenhayn Fire and Rescue to replace one 15 years old, will sell the former Carmel Fire Hall and do all they can to keep local purpose taxes low. He ended by thanking his wife Doris for all of her support as he has served on the Township Committee for 26 years. Frank Spatola, Jr., Selected Deputy Mayor. Rudy Danna, Jr. Becomes Township Committee Member. 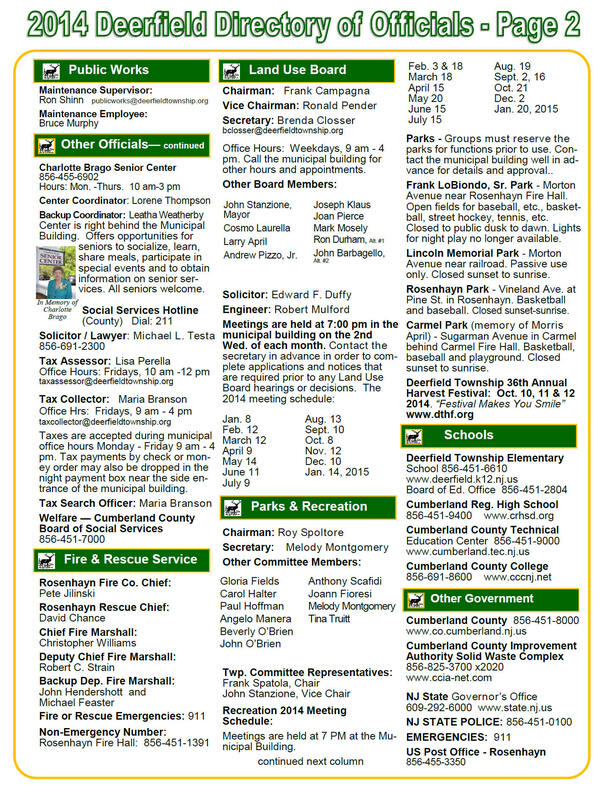 Cosmo Laurella Begins New Term on the Township Committee. Thanks to Melody Montgomery for the great photos. 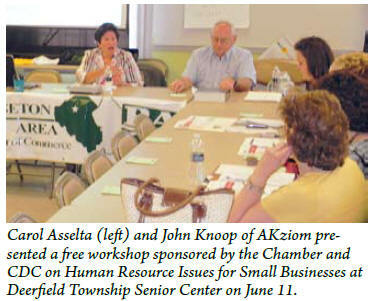 Business Meeting in Deerfield Township a Success! The Cumberland Development Corporation (CDC) and Bridgeton Area Chamber of Commerce (BACC) partnered with Deerfield Township Committee to presented one of its series of free business training and information meetings in Deerfield Township on June 11.
Business owners, employees, public officials and representatives of CDC and BACC attended the business information meeting. 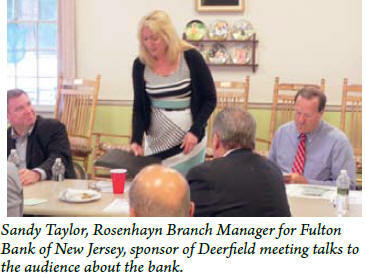 The Deerfield Township meeting was sponsored by Fulton Bank of New Jersey. In Deerfield Township, the business meeting was opened by Mayor Frank R. Spatola, Jr. and Chamber Chairman Frank T. Harris, Sr. Deerfield’s Deputy Mayor Rob Montgomery introduced the two local businesses that were spotlighted at the meeting. Russell Automotive was represented by Alvin Russell, owner, and BRECO, Inc. also known as Bridgeton Restaurant Equipment Co. was represented by Ernie Hutchinson, owner. Russell highlighted his expansion and the need for businesses to stay up to date on changes in their industries and to encourage employees to grow in knowledge of and satisfaction with their jobs. Hutchinson commented on his company’s growth and expansion related to the growth of WaWa stores here and in other states. Innovation and excellent service were sighted by him as keys to business success. Jody Hirata of The BACC Board and Century Savings Bank talked about these items especially the partnership with Cooperative Business Assistance Corp. for alternative loans. Howard Henderson, NJ Director of U.S.D.A. Rural Development explained his agency and its role in community and economic development in the rural areas of New Jersey. participants about the services available to employees and employers through their offices and through services provided by partners like Cumberland County College, Cumberland County Technical Education Center and Cumberland Salem Workforce Education Alliance. Information about the Direct Install Program called South Jersey Energy Service Plus was presented by Robert Senski. This includes energy efficiency audits for businesses and municipalities and up to 70% grant funding for the purchase and installation energy efficient lighting and other equipment. 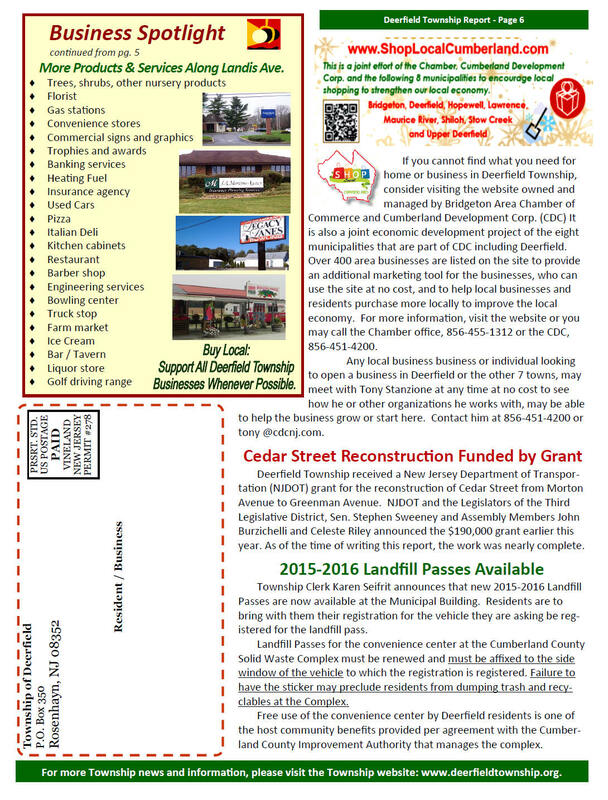 Click here for a PDF version of this Deerfield Township Business meeting notice. 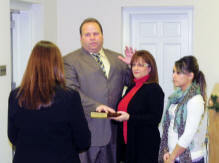 Frank R. Spatola, Jr. is sworn in as Mayor for 2013. John Stanzione tales oath of office for another three-year term on the Township Committee. Rob Montgomery is sworn in as Deputy Mayor for 2013. All Township officials are sworn in at reorganization meeting. 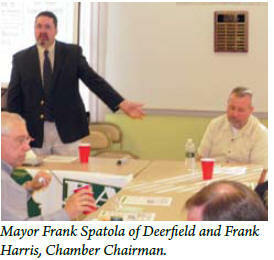 Frank R. Spatola Jr. was appointed mayor of Deerfield Township for 2013 at the reorganization meeting held Wednesday. Robert Montgomery and John Stanzione were sworn in to three-year terms on the township committee, and Montgomery then was appointed deputy mayor for 2013 by his fellow committee members. Montgomery had been appointed by the township committee to a one-year unexpired term vacated by Cumberland County Freeholder Carol Musso in 2012 and was elected to a full term on the committee in November. Spatola thanked the constituents and expressed appreciation for the "good group" of Deerfield township officials he had been appointed to lead as mayor. "This is not our government, this is your government, and if someone has a problem, we can't act on the problem unless we know what it is," Spatola addressed the public in his first remarks as 2013 mayor. "It's an open door out there, and I can't stress that enough to people. A lot of times problems get too far along before they're addressed, and that makes a very hard hole to dig out of," he continued. "But I'm very optimistic about this year. I think with the great group we have up here, we work so hard together all for one good cause, and that's to benefit the people of Deerfield Township." Spatola gave special recognition to outgoing mayor Cosmo Laurella, the lone Republican on the committee, for his leadership in 2012 and for continually serving the township as a "plethora of information" whose "heart is always in the right place." Montgomery thanked the committee for appointing him deputy mayor and also said he is "looking forward to a good year" in Deerfield Township. New Jersey's Third Legislative District, which serves Bridgeton, Deerfield and Upper Deerfield in Cumberland County and dozens of other municipalities in Salem and Gloucester counties and whose legislators include Senate President Steve Sweeney, Assembly Deputy Speaker John Burzichelli, and Assemblywoman Celeste Riley have announced that the mobile office outreach initiative will be in the Deerfield Township Municipal Building, Landis Avenue in Rosenhayn, on Wednesday, April 24, 2013 from 4 pm to 6 pm. “Informing and updating residents regarding issues on state legislation is one of our duties as legislators,” said Assemblywoman Riley. “The mobile office outreach initiative will help constituents who are interested in current legislation to ask questions about the status of bills that may affect them personally." Mayor Frank Spatola said, "we are happy to host this outreach program here in Deerfield and welcome people from throughout the area to attend." A staff member from the District will be at the building to meet with residents of Deerfield and others regarding their concerns or issues at that time. Student Council members from Deerfield Township School are collecting items and gift cards for local animal shelters in need. During tough economic times donations and supplies are down while numbers at the shelters increase. The Council members are adamant about helping animals and have already sent the C.C.S.P.C.A. a donation of $100 back in October. The school iheld an assembly on February 10th given by The Cumberland County S.P.C.A. to help support their efforts and boost awareness for this collection drive. If anyone would like to donate items they can be sent in with any Deerfield Twp. School student or dropped off during regular school hours. The Student Council is headed by Mrs. Lisa Trexler M.Ed and Ms. Meghan Mosley M.Ed. Pictured from left to right are the D.T.S. Student Council officers: Cebreice Edwards: Vice President, Edenise Garcia: President, Brooke Travis: Treasurer, Mrs. Lisa Trexler: advisor, and Heidi Helriegel: Corresponding Secretary. Missing from the picture is Giavanna Visconti: Recording Secretary. Deerfield Township School is celebrating the 50th anniversary of its opening this school year. As part of the celebration second grade teachers Eileen Morris and Laura DiPrima collected baby pictures from each staff member, scanned them and put of a display entitled “50 Years of Great Educators.” Students and staff have been asked to identify each baby. It seems like only yesterday that this school opened, putting all Deerfield k-8 students in one building for the first time. The celebration continues this year. The state Department of Transportation (DOT) has awarded the township a $137,200 grant to resurface Maple Street between Morton Avenue and Kenyon Avenue. "We hope (the grant) will cover the entire project," said Committeeman John Stanzione after Wednesday night's township committee meeting. Maple Street's cut is part of $78.75 million in transportation grants to 372 municipalities that Governor Corzine's office announced in a press release Nov. 14. The release heralds the grants as "a move that will create jobs and help keep property taxes in check." "Rebuilding the state's infrastructure, from roads to bridges to mass transit, is going to be central to both getting us out of the recession and positioning New Jersey to take advantage when the economy recovers," Corzine is quoted as saying in the release. The DOT supplies 75% of the grant funds upon awarding a contract and 25% when the project is finished. The township committee also approved a list of 12 Carmel Volunteer Fire Company members qualifying for monetary benefits based on years of active service for 2007. The Length of Service Awards Program (LOSAP) provides income benefits to volunteer responders like firefighters and emergency medical technicians (EMT's) for investment options of the recipient's choice. These may include investments like mutual funds or annuities. Aside from official business, Deputy Mayor Cosmo Laurella sought to dispel the belief among some residents, he said, that the township's annual Harvest Festival is funded with taxpayer money from the township. "It does not cost township taxpayers a cent," he said. 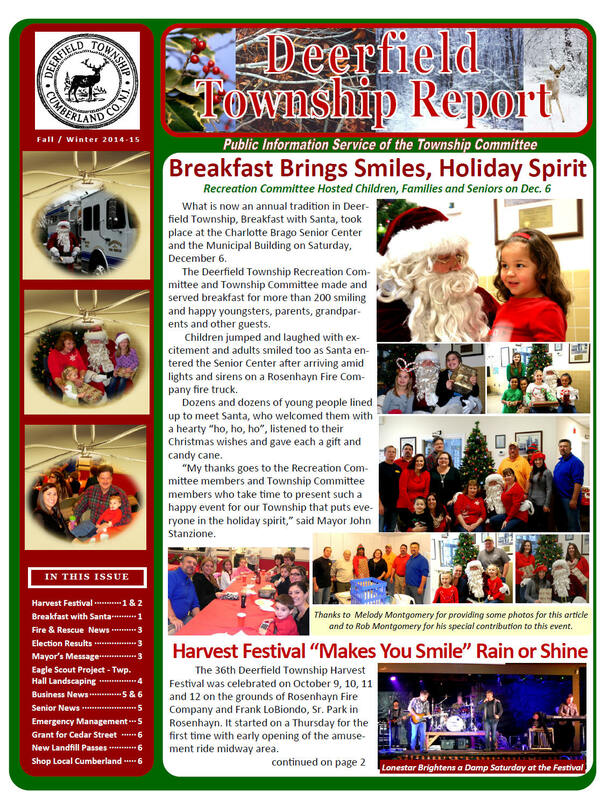 The township recreation committee generates money for the event from various fundraisers. After two and a half years in a kind of exodus, Starbound Gymnastics Academy has found a place to settle again. Starbound staff spent Tuesday afternoon in their new facility on Landis Avenue in Deerfield Townsihp, next to Parvin's Mill Flowers, assembling equipment. "We're ecstatic about moving back to this area, where our clientele is from," said co-owner Amy Middlekauff. The setup was just beginning to take shape Tuesday, with all the trappings of a gymnastics training facility stacked or lined up throughout. Mats of every type and size were piled high. Bars, horses and springboards - frightening prospects to a non-gymnast - had yet to be placed. The owners and staff hope to open the facility Jan. 5, Middlekauff said. She said Starbound has about 200 clients. An additional 50, she said, seek to come back now that the academy is back in town. On June 1, 2006, lightning struck an electrical box at the academy's former location off Route 77, in Upper Deerfield, and the building was totaled. Starbound eventually set up temporary shop in facilities owned by Stanker & Galetto, Inc., at Millville Airport. But that was too far away for some customers, Middlekauff said. Incorporated in 1995, Starbound trains kids 18 months and older in gymnastic skills. It also offers classes in tumbling and cheerleading. It has 12 staff members, Middlekauff said, instructors who are safety certified by the United States Association for Gymnastics. They are also current or ex-gymnasts themselves, she added. Corrine Wright is a 1985-86 alum of the U.S. national team and a former Division I competitor at the University of Georgia. She has worked for Starbound for about a year now, she said. "I've worked for a lot of people, and it feels much more like family here," Wright said. Setting up anew was also something new to her. "This is the first time I've ever helped build a gym," Wright said. Starbound offers field trips and other recreational activities for children. Some groups involved are Girl Scout troops and home schooling students, said co-owner Lisa Battavio. The variety of activities reflects the staff's theory that gymnastics reaches into lots of areas. "We feel this is a real valuable sport," Battavio said. "It comes over to more aspects of life than people imagine." Kids learn much about dedication and physical fitness, Battavio said. She added that they also make new friends and achieve a degree of socialization. Starbound also has three rental properties the owners hope to offer for dance instruction.But the owners and staff are thankful enough to be home in a new building. "We want to thank everybody for their support over the past two and half years," Battavio said. She's especially grateful to contractor Leigh Marcello of Vineland-based Trimark Building Contractors, who has readied the academy's new building. "He has worked above and beyond to help make this facility a reality," Battavio said. Two hundred people joined the Deerfield Township Committee in honoring Charlotte Brago and Louis Pizzo on May 6, 2007 at the Municipal Building on Landis Avenue here. Speakers at the tribute included Mayor John Stanzione, Deputy Mayor Cosmo Laurella, Township Committee members Carol Musso and Laura Pizzo, Congressman Frank LoBiondo, Cumberland County Freeholders Douglas Rainear and Mary Gruccio, former Township Committeeman Anthony Stanzione, Charlotte Brago and Tina Bidic. The ceremony included ribbon cuttings and unveiling of signs for the Charlotte Brago Senior Center and the Louis Pizzo, Sr. Community Room, dedication of photo collages for the two rooms honoring Mrs. Brago and Mr. Pizzo, dedication of an honor roll of those who served on the Township Committee from 1897 to 2007 and fellowship and refreshments. Both honorees were joined at the ceremony by many family members and friends.